Most of you will be familiar with the appealing little boy with the boot at Assiniboine Park in Winnipeg. 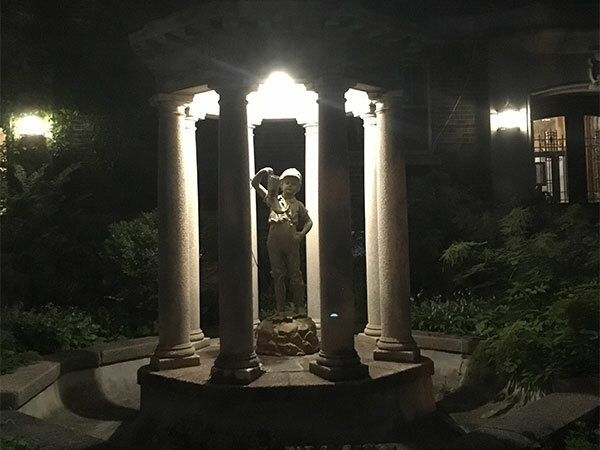 The three hundred pound bronze fountain stands in its own little pool in front of the entrance to the International Goodwill Garden, opposite the duck pond, and many people are inclined to take the little urchin with the holes in his boot for granted. He created some furor and interest as to his origin and history when he was discovered in a clump of willows in the duck pond in 1948. Letters to the newspapers asked questions and gave approximate answers, but how the legends flew! Some people said the boy stood in front of our City Hall; others said he did not. Some said he was a memorial erected to the memory of a bootblack who piled his trade at the corner of William and Main and who was lost in the marshes north of Winnipeg; others said it was not a bootblack but a little newsboy whose death was commemorated. Some said The Boy arrived in Winnipeg in the 1880s; others said he was unveiled during the visit of the Duke and Duchess of York in 1901. Only one of these statements is correct. The Boy did originally stand in front of the City Hall. He was part of the Jubilee Fountain celebrating the Jubilee Year of Queen Victoria in 1897. The other part of the Memorial remains to this day in front of the City Hallthe bust of Queen Victoria on a tall pillar with the date 1897 stands in the midst of a circular garden now instead of circular pool. The Boy and the Queen were unveiled together on 16 July 1898 by the Governor General of Canada, Lord Aberdeen. It was Children’s Day of the annual Winnipeg Industrial Fair and the day was appropriately chosen for the unveiling. All the children of the churches of Winnipeg raised the money to buy the Boy. The effort was inspired by Mrs. Bidwell Lane, the wife of the rector of Grace United Church. Mrs. Lane was the leading light of the young Christian Endeavorers who saved and collected enough nickels to make $1500, the cost of the Boy. I suspect some of that large sumfor that time it was indeed a large sumwent to cover freight charges for shipping the boy here, but I have no proof of it. The Boy was not too well received. For one thing, the fountain part didn’t work; the water stopped flowing through the holes in his boot about two or three weeks after installation aand complaints in the newspapers of six months later indicated that there had been no successful repairs made. For another thing, critics about town thought the tattered little urchin was not a fitting or proper companion for Her Majesty. We gather that the complaints and criticism never ceased for finally the Boy was removed. Again hearsay comes in and we must try to imagine the truth for we have not found the written facts. It is said that the Boy left the City Hall in 1913. Some think he lay in a warehouse or shed of the Parks Board for a few years before finding his way out to the duck pond. But Mr. F. T. G. White, past superintendent of the Parks Board says that the Boy went straight to the Park from the City Hall and remained by the duck pond until he was ‘discovered’ by a news photographer in 1948. In any case, he is a popular boy now and has a nice place to live. But did you know he has relatives? Lots of them. Winnipeggers who have travelled to other places have found other boys and have sent pictures of them to the newspapers and to the Parks Board. There is a boy in El Paso, Texas, one in Sandusky, Ohio, another in Fresno, California, still others in Hershey, Pennsylvania, and in Cleethorpes, England, and even one in the basement of a house in Toronto, Ontario! Not all of them are bronze; some are cast iron and must be painted every few years. Most of them have had their raised arm broken once or twice and the repair job has changed the angle at which they hold their leaky boot (whose holes range in number from one to five; ours has four). We have more detailed information about two of the boys, which leads us to speculations as to the origin of our Boy. The boy in Cleethorpes, England which stands on the Kinsway was presented to the town by Mr. John O. Carlbom, a former Swedish Vice-Consul to England whose sons were born when he lived on the Kingsway. He had seen and loved a similar boy in Stockholm (another one!) and had the Leaking Boot, as it is called there, duplicated for Cleethorpes. The boy in Sweden stood in the garden of a restaurant owned by Mr. Richard Davidson, who had seen the boy in Italy and brought him back to his native Sweden. Did he bring back the original boy or a copy of him? Perhaps there is still another boy somewhere in Italy. The cast-iron boy in Hershey, Pennslyvania stands over a small lake in the Rose Garden of the Hershey Estate. He was purchased in 1906 from the J. L. Mott Iron Works, New York City, and is supposed to be of Italian origin. We have tried to contact this company, but according to the New York postal authorities, it no longer exists. So we must finish the story of the Boy with pure theory. I think that he was purchased from the J. L. Mott Iron Works. It was only eight years before the Hershey Boy was bought so it is quite possible. Then there are all those other towns in the United StatesEl Paso. Fresno, and so onthat must have been supplied from somewhere. I think that the original cast which the Mott people used was of Italian design. I hope the original sculptor was well paid for his work. I wonder if he knew he would be the source of so many park ornaments in North America?